General Information: Green almonds are the unripe, undried version of the common nut eaten throughout most of the world. Green almonds are not very common in the U.S. but they are much more popular in Middle Eastern and European cuisine. The fresh "grassy" flavored green almonds are eaten as a snack, used in salads or made into a paste. Use the almonds shaved, sliced or whole in soups or salads. A traditional snack in the Middle East, green almonds have recently caught on with adventurous chefs. 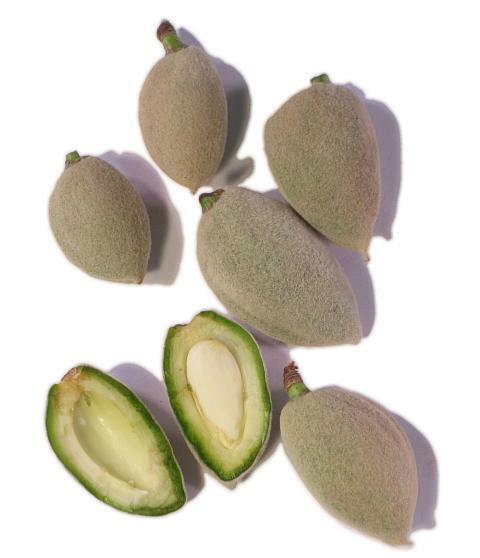 The fuzzy green almonds change markedly during the springtime harvest: In April, they're tender enough to eat whole and have a herbaceous taste (like a raw pea pod, but slightly tart and bitter); brined or dipped in salt, they're addictive. Within a few weeks, the hull and shell toughen, and the seed, which hardens from translucent jelly to a crunchy white nutlet, is the only part eaten.